1916-2016. Acqua di Parma is a hundred years old. A century of history which, now more than ever, has seen the brand become a world ambassador for Made in Italy thanks to the enduring values which are part of its origins and its DNA. A hundred years of savoir-faire and understanding of quality of the highest level. A hundred years of strictly Italian craftsmanship during which Acqua di Parma has always employed the most careful manual production techniques. Every one of its products is crafted in individually selected Italian workshops where the secrets of the trade are passed down through the generations. Every single item is created with patience, time and dedication according to the spirit of the oldest master craftsmanship, using only the most valuable materials. Rare essential oils, the purest waxes, woods and precious metals, beautifully tactile and visually appealing leather, quality fabrics. At the beginning of the twentieth century, Baron Carlo Magnani, the educated, refined heir to one of Parma's oldest families, lived in Parma. His grandfather, Girolamo Magnani, was a 'painter, director and set designer" in the mid-nineteenth century at the Teatro Regio – the royal theatre – and his set designs were Giuseppe Verdi's favourites. The elegance of his mannerisms and habits, his sensitivity to art and culture, that all-Italian savoir-vivre of the true gentleman, were for Carlo Magnani a heritage that was innate in him. But the fragrance in which he could be fully recognised did not exist. Therefore, driven by the desire to be able to rediscover his world in a fragrance, he commissioned a skilful master perfumer to create it, and it was from his exact instructions that, in 1916, a hundred years ago, an exceptionally fresh and modern fragrance was born. 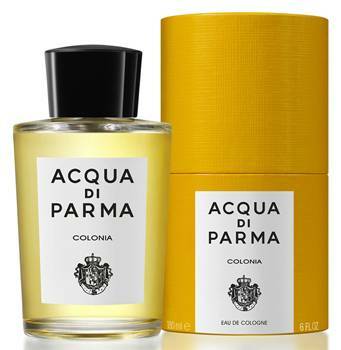 Colonia Acqua di Parma, the first truly Italian cologne. From then on, the brand itself, synonymous with excellence in craftsmanship and with an awareness of elegance and beauty, became part of the heritage and history of the city, with a deep affinity which grew and strengthened over time. Straight away, the brand's image found its conventions in the place where it originated. The unmistakeable Parma yellow which has characterised the aristocratic houses of the city since the baroque era and represents its symbolic shade became Acqua di Parma's iconic colour. forward intelligently into the contemporary world, keeping intact its link with its roots and its DNA. It is the milestone of the first hundred years of this genuine Italian art of living that the brand is proudly celebrating today. A way of life which, as much nowadays as in the past, has fascinated and engaged a following from all over the world: well-informed and civilised men and women who have held the same shared values for a hundred years.